A Round Table discussion on “Security of Coast Line and Coastal Assets” by FICCI (Federation of Indian Chamber of Commerce and Industry), TNSC (Tamil Nadu State Chapter) Maritime Strategies Panel in association with the Chennai Chapter of the NMF (National Maritime Foundation) was convened on 10 August 2012 at Seafarers Club, Chennai. This turned out to be a Brain Storming Session on Coastal Security and also during this session INSARFO (International Search And Rescue Facilitation Organisation) was unveiled. Mr P Murari, IAS (Retd.,), Advisor to FICCI President & Former Secretary to President of India was the Chief Guest. 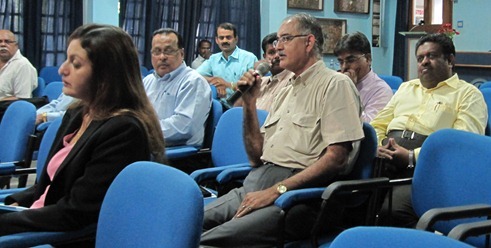 Representatives from the Indian Navy, Indian Coast Guard, L & T Shipyard, NSRY Kochi, Industry participated in the session. Opening Remarks: by Commodore (Retd) S Shekhar, Convenor, Maritime Strategies Panel – FICCI Tamil Nadu State Council & Regional Director, NMF. 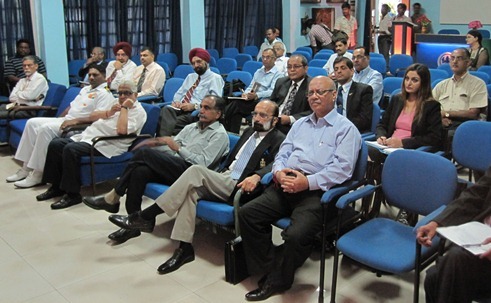 Presentation on Perimeter Intrusion Detection Systems: by Commodore (Retd) KP Ramachandran, VSM. Presentation on Patrol Boats: by Baung Utara Sdn Bhd (BUSB) from Malaysia. The recently concluded Second International Search And Rescue Conference – ISAR 2012 at Kuala Lumpur from 3 to 5 July 2012 highlighted the gaps existing in the present Global SAR functions. SAR operations required for Land, Sea and Air are different in terms of assets needed (aircrafts, ships, road transport); services to be provided (medical, shelter, food, water); Command and Control Centre to integrate the assets, human skills, technology – data base management, satellite – pictures, communication, global positioning system etc. During a disaster/SAR, the people nearby/volunteers are the first to reach and extend help. INSARFO is needed to supplement existing organisations in creating a body of SAR professionals who are well trained and ready to assist formal and official organisations in the effective delivery of SAR functions. Initiating Organisation: to commence ground work in the respective countries and to identify National Convenors. National Convenors: have to interact and seek support of government/industry/social service organisations in the respective countries. Draw up the charter of duties, functions and responsibilities of INSARFO. Initiate membership drive, fund raising, setting up permanent establishment etc. On approval of draft constitution of INSARFO, the organisation is launched and starts functioning. Step 1: International Convening Organisation – an independent organisation with professional knowledge, experience and infrastructure is needed to take up this role; Global SAR Resources Sdn Bhd, Kuala Lumpur, Malaysia is the most suitable organisation to take up this role immediately; Major (Retd) Murali Bhaskaran, RMAF, Founder CEO has initiated steps to register INSARFO as NGO in Malaysia; Commodore (Retd) S Shekhar, Founder Director of JMPS Sanjivini Consultants (Pvt) Ltd, Chennai, India is rendering all necessary assistance. Step 2: CEO, INSARFO – would identify neighbouring countries having SAR capabilities; would identify suitable organisations/individuals to be designated as National Convenors of INSARFO. Step 3: On getting sufficient number of individuals/organisations (from Malaysia and neighbouring countries like India, New Zealand, Japan, Brunei, Indonesia) would commence preparing draft constitution for INSARFO; simultaneously National Convenors of the respective countries would commence setting up of national bodies within the acceptable framework of International Convening Organisation. Step 4: The Constitution of INSARFO be ratified, adopted and promulgated at ISAR 2013 at a mutually convenient venue. Step 5: Progressively INSARFO through its constituent National Chapters would demonstrate its commitment, competence for the effective performance of SAR functions to global standards leading to recognition by UNO (United Nations Organisation) and granting of Consultant status. 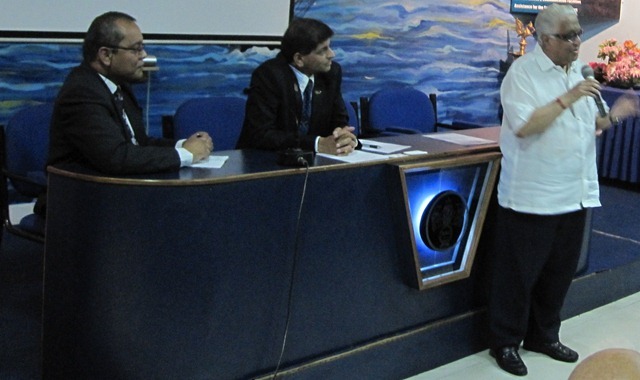 Maritime Strategies Panel (MSP) of FICCI, Southern Region was proposed as the Indian Chapter of INSARFO. FICCI National Body would further steer the formation of Indian Chapter of INSARFO through the appropriate organs of the Government. MSP – FICCI – SR would further identify suitable professionals and academic institutions to take on necessary functional responsibilities in consultation with the International Convening Organisation in Kuala Lumpur, Malaysia. Smartdec is Perimeter Intrusion Detection Systems (PIDS) that is designed and developed for surveillance of remote areas. Smartdec uses four basic components: Detector; Base; Handheld; Command Center Software. Detectors are compact, portable, battery powered (can operate upto 400 days without recharge/replacement). Advantages of using Smartdec PIDS: wireless; wide area coverage; battery powered; easy and fast set up, relocation; automatic network creation without configuration; inconspicuous, variety of camouflages; tampering detection; encrypted communication; reduced operation/maintenance cost. More details of Smartdec Perimeter Intrusion Detection Systems (PIDS) are available at: Remote Monitoring System – DEFENDEC. BUSB boats use combination of aircraft technology and marine technology; these composite boats are built by using laminated special GRP and FRP layers with marine grade Aluminium Alloy. BUSB boats are lighter in weight; stronger than steel, bullet-proof; better fire-retardant; need low maintenance. The smaller boats weigh as less as 700 kg, have speed upto 40 knots with 9 hours of endurance and can safely operate with 0.2 meter draught. 4 stroke petrol OBMs are used to propel these boats. These boats can be easily transported by road, air for quick deployment in coastal areas at short notice. BUSB also provides training courses in: Boat Handling; Boat Maintenance; Boat Operations; Tactical Navigation; Tactical Instrumentation. Services provided by BUSB are: After Sales, Spare Parts, Maintenance, Repairs, Consultancy. More details of these boats are available at: Baung Utara Sdn. Bhd. As type of coastal surveillance varies from coast to coast in India, the parameters for the patrol boats must be specified and then the boat manufacturers must be approached to build suitable patrol boats. Though BUSB Composite Boats may be suitable for deployment at short notice, crew comfort must be adequately provided for long-term, sustained use. OBMs with diesel as fuel must be introduced for the Indian Market. Private boat builders in India are discouraged to supply patrol boats to the Government agencies due to lengthy, unusual procedures. Fishermen: the potential of fishermen to act as ‘eyes and ears’ at sea to collect intelligence must be maximised. Coastal Environment: protecting the coast from pollution must be part of coastal security. 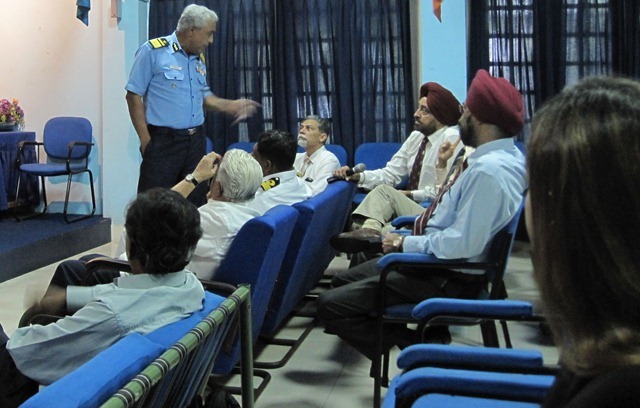 Perimeter Intrusion Detection Systems (PIDS): Representatives from L&T Shipyard at Chennai and NSRY, Kochi appreciated the capabilities of the system. Though the existing global SAR network is effective, there is always a scope for improvement through INSARFO to train, provide necessary human skills for SAR operations. Ships deployed must have mortuary/facilities to preserve the bodies recovered at sea. Personnel deployed for this task must be adequately trained to handle the victims. Thanks to FICCI and NMF to organise this Round Table Discussion at Chennai. It’s nice to know that there are still blogs that are dedicated in informing the non searfaring community about the latest news in the industry. Although I’m sure not everyone will understand this, you guys should pat yourselves at the back for continuing to give service not only to the seafaring community but to the whole society in general.